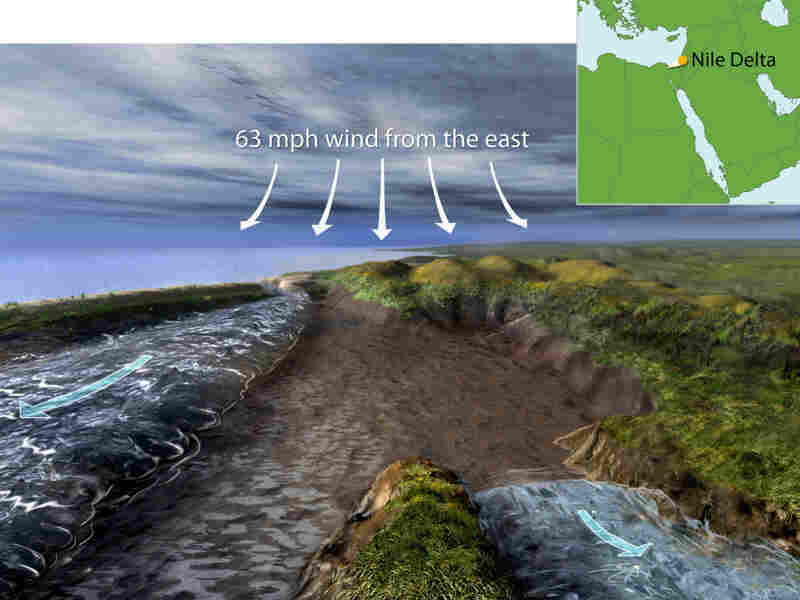 Study: Wind May Have Helped Moses Part Red Sea Using a computer model, Carl Drews of the National Center for Atmospheric Research found that a strong wind blowing in the right spot could cause the water to bend, leaving a gap. Drews says his research supports the biblical account of the Israelites' escape from Pharaoh's rule. About 3,000 years ago, according to the Book of Exodus, Moses "stretched out his hand over the sea; and the Lord caused the sea to go back by a strong east wind all that night, and made the sea dry land, and the waters were divided." And then, according to the Bible, the Israelites were free from Pharaoh’s rule. Fifty-five years ago, Charlton Heston stood in front of a Hollywood mock-up of the Red Sea and commanded the waters to part in Cecil B. DeMille's The Ten Commandments. Today, Carl Drews, a software engineer with the National Center for Atmospheric Research, has parted the waters again -- this time with a computer. Drews looked closely at verbiage in the biblical account given in Exodus 14:21, which describes a strong east wind blowing overnight that caused the water levels to drop and part. "This is something that is known in meteorological science as wind set-down," Drews tells NPR's Guy Raz. In a computer model, Drews was able to simulate what might have happened at the Red Sea just before Moses started a journey that lasted for 40 years. After modeling a body of water that resembled the waters trapping Moses and the Israelites, Drews enforced the laws of physics and applied a wind stress to the water body. "What I did was use a wind, sort of the strongest wind that I thought ... a mixed group of adults and children could walk straight into," Drews says. This amounts to about a 63 mph wind -- a medium-strength tropical storm, as measured by the scale the National Hurricane Center uses. But this is different from other tropical storms that occur frequently around the world. "The wind blows on the water, and it stacks it up at the other end. The opposite component of wind set-down is called storm surge," Drews says. He proposes that there was a bend in the body of water pointing east, and as the water shifted, it separated at the point of the bend, leaving a gap there. Through his research, Drews says, he is fairly certain where Moses was at the time the waters parted; it was not at the heart of the Red Sea. “The place I picked is not at the Red Sea proper, it’s at the north end of the Suez Canal in one of the shallow lagoons along the Mediterranean Sea.” As Drews points out, the term Yam Suf, a biblical term used in Exodus, means a marshy area filled with reeds. This is the same area where a British general named Alexander Tulloch witnessed a similar wind set-down event in 1882. Drews says Tulloch’s observation is modern-day evidence of what happened when Moses reached the Red Sea, and supports his latest research. While many researchers use science to disprove literal accounts in the Bible, Drews looks at scientific evidence that supports biblical events. “I think my account matches the biblical account pretty closely,” he says.